The object looks to be some sort of an odd-looking chair. It sits on the floor with what looks like a concrete or stone cylinder-shaped base. I would estimate it's about forty inches around and maybe ten to twelve inches in height. Around the base is a copper-colored metal pipe, which wraps tightly around the stone base. The metal pipe wraps around the base then nearly come together on the back side of the chair, coming within about two inches of each other at the rear of the chair. The pipe then hooks up, still about two inches apart, and goes up to about eighteen inches before being capped by a yellow back rest, which I will come back to in a few. On top of the stone base is an orange piece, that could be metal, clay, maybe even pottery. It's shaped as a half-pipe with the single cushion of the chair resting inside the raised edges. The half-pipe extends out over the left and right edges of the base. Facing the chair. The half-pipe extends approximately eight inches over the left side and about two feet over the right side. On the right side of the half-pipe, at the end of the two feet, the pipe hooks downward and touches the floor making it look somewhat like a very long slide but only the last few inches are angled. On top of the half-pipe, resting inside the half-pipe, is a striped dark blue and forest green cushion. It is about twelve inches long, resting an inch or two from the left edge and stops before the half-pipe hooks down on the right. The stripes on the cushion run width wise, so from the back of the chair to the front, and start with a blue stripe on the left, then switches from blue to green and back to blue as it goes across the seat. The forest green stripes, except for the very last at the right edge, are all the same width, about three inches each. While the blue stripes change, the second, forth and fifth stripes are the same size as the green stripes while the third and sixth stripes are approximately twice as wide. The cushion starts with blue stripe, which is approximately half the width of the others and ends with a green stripe, on the right, which is half the width of the others. There are twelve stripes in totals. As stated above, the metal pipes hooks up and holds up the yellow cushioned backrest. I would estimate, on the front face, the back rest is approximately fifteen inches across and eight inches from top to bottom. The back rest is barrel-shaped and is about twenty-four inches in circumference. The back rest begins approximately eight inches or so above the cushion of the chair. The chair does not look like it was built for comfort. It looks more like an art piece than an actual chair. With the cushioned seat and the backrest, it simply looks most like a chair. This object is likely a lounge chair with attached lamp for reading.There is a large round grey base, approximately three to four feet across and at least one to two feet in width or thickness. It acts as a base for the lounge part of the apparatus to rest on. The lounging apparatus is approximately 3 to possibly 4 feet wide Its thickness is no more than a few inches and is colored a dusky orange. 2/3 of the lounging section lays across the round base, with the end curled down towards the floor. The length of the lounging section extends the opposite direction past the round base, extending approximately two or more feet, no more than 3. It then curves downward directly to the floor to rest upon the floor. So the round base acts to hold the lounge up on one end and it remains secure and upright on the other end by resting on the floor. Attached to the lounge is likely a thick cushion. It does not extend the entire length of the lounge apparatus. It alternates in decorative colored stripes, first one forest green or navy blue stripe followed by one light green stripe. These stripes alternate, designating the striped pattern. The cushion is much thicker than the lounge base, twice its thickness. It lies atop the lounge, from the curve of the lounge by the grey base to the end of the curve of the lounge where the lounge meets the floor. It does not curve with the lounge. It is flat and rectangular, as is the lounge. The light apparatus cover is lime green and in the shape of a one-foot circle, cut in half. It is longer vertically than it is horizontal. Two poles of gold extend below the lime green cover and flow to the floor, encircling the grey base, one pole going around the left of the base and the other going to the right of the base. To give an idea, it is likely this entire object is as big as a typical three seater sofa that one would find inside someone's home. It is entirely long enough for a person of average height, say five foot seven, to lie down comfortably without their feet or their head dangling off. Also, it is at least as wide enough that an average size person could lie down on their back and have at least 3 inches of lounge free to their left and right. If an obese or very fat person were to lie down, say a woman who was size 24 or 26 (USA size), then it is likely very little of the lounge would be seen. If a man or woman taller than five feet nine inches were to lie down, their feet would definitely dangle off the end. It is likely the lighting apparatus is indeed for reading or viewing better although there is no string or chain to be seen that one would pull to activate. It is likely this light, if that is indeed what it may be, is one that could be touch activated, perhaps allowing for 3 different levels of light for the person lying down. More likely it wouldn't be used for resting in this manner as the light sits well above the lounge by a good 4 or more feet. That would spread far too much light for a person lying down. More than likely, it would be used to sit up to 3 guests and the light would then be more appropriate. Likely the materials used for the cushion, if this piece were to be placed in the public, would be covered in leather or perhaps a very sturdy plastic type covering to give it an easy cleaning. The lounge itself made of either colored metal or durable plastic. The light poles colored to look like brass and the shade or covering for the lamp possibly glass or hard plastic as well. The base is gray with rounded edges. It is not clear whether it is a rock or some kind of inflated base that sits in the center under the lounge. It holds up the lounge itself and the lounge would tip down onto the floor without this base under it. It is about two-thirds the size of the lounge and the majority of it is concentrated on the one end of the lounge that is not touching the ground. In this way it is balancing the lounge chair wooden base. The gray base has crisscrossed lines that are gold and form two elongated diamond shapes in the middle of the visible part of the base. Either end of the diamond shapes has three other crossed shapes forms from the intersections of these lines.The lounge chair sits on the base. The lounge is orange and appears to be made of some burl wood, and not very thick. It lays across the base with the head part curving into itself in a small curve that is not so curved as to loop. It just curves a little back towards the bottom of this wooden base. The end part of the lounge has an attached part that curves down and rests on the floor. The edges of this base are very sharp, straight and flat lines. The cushion lies on top of this base. The cushion is covering the entire lounge from one end to the other, from where it starts to curve at the head end, to where it starts to curve at the foot end. The cushion appears to be made of cut foam which is visible on the long side. The stripes of the cushion clearly go straight through the foam as is visible on the long side. The cushion curves up on each end to a point. The cushion is not just a straight rectangle. The colors are lime green and blue stripes. The stripes are more narrow on the side than what can be seen on the top. The side stripes going up and down but the top stripes are diagonally across the top. Eleven blue stripe parts are visible of the long side. The twelfth blue stripe at the head end of the lounge, is not straight but curves widely on the bottom.There are twelve green stripes visible on the side with the first and last not completely visible. They have been cut off by the curves that are formed at the head and foot end of the cushion. Lines drawn in the top of the cushion give the appearance of softness. Two thin yellow lines curve up from the head end third of the lounge. These lines may represent electrical wires or the base of a tall lamp. The yellow lines are inches apart and curve up until they meet a light suspended over the head end of the lounge. The light is a shade or pendant light that is the same lime green as the stripes in the cushion. The inside of the pendant shade is yellowish from the light that is on and illuminating the head end of the lounge. 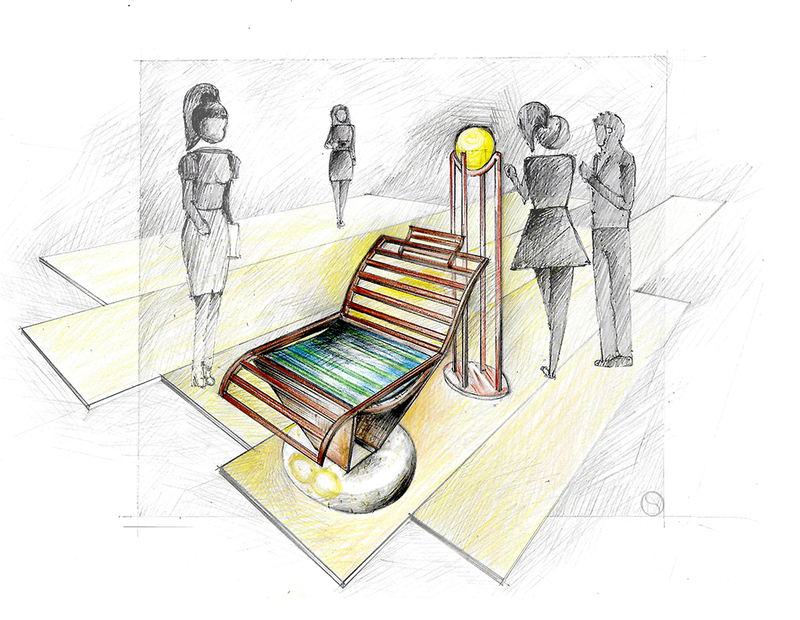 This object is a combination chaise lounge and floor lamp. This modern and innovative lounger showcases a unique and exquisite form language all its own. The base and main structure of the chair is made of a sculpted marble or wood material and is patterned tan and brown in hue. It is sleek, modern, and with a unique and distinctive surface treatment. The top portion of the chair's frame twists and folds over providing neck support, as well as a beautiful sculptural detail. The top edge of the chair's frame is also slightly scalloped. The lounger itself sits on a large stone base to provide ample support. The stone is a mottled and speckled gray in color, possibly granite or some similar stone. It is large and provides support, but does not take away from the comfort of the chair itself. Two linked gold ovals can be seen on the facing side of the stone. The sleek chair frame is topped with a colorful and geometric cushion. The cushion is about 2 inches think and sits atop the marble base of the chaise lounge. The cushion stretches from the top headrest portion of the chair to about 2 feet from the bottom of the chair's frame. It is a stripped blue and green pattern with stripped green and white on the edges of the cushion. The unique color scheme of the chaise lounger's cushion pairs well with the deeper reddish-brown tones of the frame. It looks like the cushion is just sitting atop of the chair's frame and is not attached in any permanent way. Directly behind the chair (it's hard to tell if it is attached or not, as the base of the chair is obstructing the view), there is a free-standing floor lamp. The lamp itself is also modern and unique in style and pairs quite well with the chair's design. The lamp is constructed of a metal, possibly brass, and is rose gold in color. The base of the lamp is oval and about a foot in length. Four poles come from the base of the lamp and taper and meet towards the top of lamp, where it attaches to the shade. They form a slight u-curve at the top. The lampshade is round and a bright yellow color. There are no patterns or other adornments on the lampshade. The lamp is sleek, unique, and modern. There do not seem to be any switches or pulls on the lamp to turn it on, so I am not sure how it is powered on and off. It's unadorned, but sleek nature pairs perfectly with the chair, which contains quite a few different patterns and styles. They complement one another beautifully. The chair, while it may not be the most comfortable for relaxation purposes, is surely a stunner and a unique conversation piece that would add beauty and style to any room. It combines modernism, classicism, nature and industry, patterns and textures, all into one beautiful piece. due to its size and materiality it was unfortunately not possible to execute this part of the "repeat after me" series.